Orthotic device market is valued $1,429.5 million in the year 2017 and is anticipated to grow with a CAGR of 4.2% from the year 2018 to 2023. 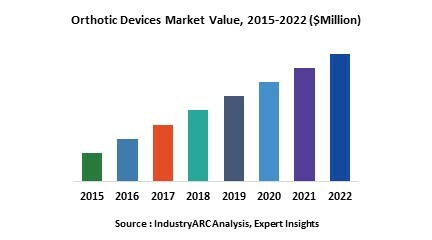 Orthotic devices is segmented based on the methods of manufacturing where custom devices are widely used devices followed by the prefabricated OTC which are having the market share of $2,180 and $1,490 million in the year 2017 and is expected to grow with a CAGR of 7.3% and 4.2% during 2018 to 2023. What is Orthotic devices Market? Orthotic devices are used to correct the abnormalities or to alleviate the pain in the musculoskeletal system. Orthopedic shoes helps in correcting the abnormalities and reduce the pain. These devices are fitted to the patients affected parts and it functions in different ways based on the design to provide the desired effect. These devices are commonly used in mild diseased conditions to relieve pain and maintain correct posture. Orthotic device are segmented based on the device types such as cervical orthoses which are used to treat or support the neck and spine of the individual, upper extremity orthotics are the devices which are used to improve structural and functional characteristics of the musculoskeletal and nervous system . Lower extremity orthotics are applied to lower body segment which includes hips, thighs, knees, ankle and feet. What are the major applications for Orthotic device Market? Orthotic devices are mainly used by people who are suffering from chronic devices which includes diabetes, heart diseases. Orthotic devices such as foot insoles are used by people with diabetes and arthritis to relieve or manage pain. Orthotic device is also applied during injuries which are caused by sports or accidents the common sports injuries that lead to toe pain, knee pain can provide relief from a good sports orthotic insoles. The launch of smart socks called smart Moore balance brace which will track the motion, stride length, cadence and gait that physical therapists can analyze the condition and track the recovery by sending the text messages and voice feedbacks to the patient through mobile app. By using this smart socks patients do not have to spend lot of time in hospitals consulting the physicians. The traditional orthotic devices does not give the information of stress loading and concentration analysis to overcome this issue the introduction of 3D printing technology in orthotic devices to transform the design, comfort and utility and customization of ankle foot orthotics. To cure the spinal cord injuries a new chip has been introduced which is implanted in the patient brain where the brain is effected if there is any injury to spinal cord. The chip reads the brain signals and communicates through a computer screen which is attached to the patient’s sleeves. The other development to cure the spinal cord injury is epidural stimulation theory. This procedure uses continues electric current at different frequencies to stimulate the spinal cord to reawaken its neural processes. It works by implanting a simulator into spinal cord which can be turned on or off according to the patients requirements via remote. When the stimulator is on the ongoing electric stimulation connects the brain impulse and allows the person to sit with a support or stand using a walker. Who are the Major Players in Orthotic device market? The companies referred in the market research report includes Acor Orthopaedic, Inc., Aextrex Worldwide, Inc., Deroyal Industries, Inc., Djo Inc, Basko healthcare, Alcare Co. Ltd, Deroyal industries and more than 10 other companies.